Driver Magician is an advanced and professional software solution that will allow you to perform tasks like driver backup, update, removal and restoration on MS Windows powered computers. This application scans and identifies your hardware, extracts the drivers and then stores them for backup purposes to a predefined location. This is highly useful when you perform fresh Windows installation and you don't have access to (or if you lost) your original drivers CDs. Additionally, Driver Magician features a comprehensive database containing the latest drivers. This database is constantly updated, if an active Internet connection is available. By using this software you will be able to save precious time. This tool will also increase your productivity by providing the latest drivers and improving your system's performance. Driver Magician will also help you detect unknown devices connected to your computer, thanks to its integrated hardware identifier database. - Backup PC drivers in four modes. - Easily restore all drivers with only one mouse click. - Update drivers and increase system stability and performance. - Easily uninstall hardware drivers. - Scan and detect unknown devices connected to computer. - Save and backup various items (My Document, Desktop, etc.). - Offers detailed information about the hardware drivers. 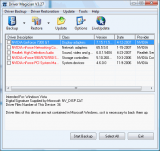 - Save all drivers as an executable file, allowing you to restore drivers without Driver Magician installed. The drivers are obtained from the original equipment manufacturers. Creates backup copies of your drivers and commonly-used folders. It won't run the downloaded installers automatically. Driver Magician has been tested by Download82.com team against viruses, spyware, adware, trojan, backdoors and was found to be 100% clean. Our editors will recheck this software periodically to assure that it remains clean.